The village of Pubol is known as being part of the Dali triangle, named after the famous surrealist painter Salvador Dali. Pubol is the site of the Castle of Pubol, the residence of his wife and muse Gala, who allowed Dali to visit her when she wanted. Dali himself lived in Port Lligat close to Cadaques and the third point on the triangle is the Dali Theatre-Museum in Figueres created by Dali himself at the site of the town's theatre and now world famous for its collection of Dali works. While the theatre-museum is extremely extravagant in the Dali style, Pubol remains a small Catalan village built in traditional stone with the castle itself a relatively plain catalan village castle and not particular striking with high walls with few windows. From the outside the only signs of the collection with Dali are a white statue that is just visible from a distance above the walls of the castle, and the Dali souvenir shop next to the church and the bus loads of tourists that appear from time to time. Somewhat disgracefully, we still haven't been inside the castle itself to see what the interior looks like. The aim of the walk though was to come past Pubol on the way back as we decided to start in the neighbouring (and grander) village of La Pera. The area itself is off the beaten track - it's neither in among the Gavarres, nor on the way to anywhere. 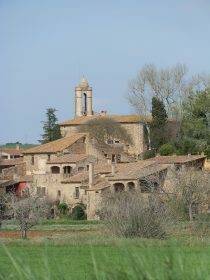 Instead the area is rolling countryside alternating between woods and fields, interspersed by large masia farmhouses, and the occasional hamlet, and makes for very pleasant walking. We parked and started at La Pera. The first part of the walk is on a tarmacked road, but it's very quiet as the road only connects La Pera to the neighbouring hamlet of Riuras. The road passes through green fields and the first real signs of leaves returning to the trees can be seen, with a collage of greens. 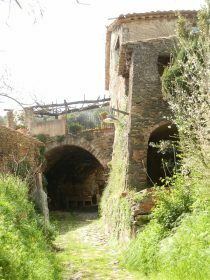 We get to Riuras and find a small collection of houses, one built with an arch over the torrent path. Continuing through the village we run into woods and a stream that carves its way down the hill to our right. The sun has brought out the first butterflies in creams and yellows flitting amongst the growing grasses. In the woods, the path turns to the left and half a couple of hundred metres on the woods break into a mass of stumps and lumber across the side of the hillside. 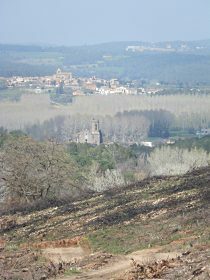 A forest fire ripped through the area in August 2012 leaving blackened branches on the floor, but most of the trees themselves have been collected and cleared leaving a broad open expanse with views across to Flaca and Celra. At the first left we turn up the hill through the remains of the woods. The path is muddy underfoot and great bundles of tree trunks lay stacked up to the side in dark piles. The burning must have been very extensive as it continues for 2-3 km. However, the dead trees constrast with the vivid greens of the grasses and meadow flowers growing in the light. The loss of trees also means you can see the remains of terraces and we speculate that in the past this might have been an area of vineyards before the woods took over, possibly after the phylloxera devastation in the 1880s-1890s. We arrive close to the hamlet of La Vilosa and pass a family out gathering wild asparagus. The path takes a left hand turn (it's the second left as you pass), past a house with an enormous long sloping roof and enough space for it's own private basketball court. By now we're back in green woods and the trees alternate with fields, with a sea of bright yellow rapeseed in flower and views up to Els Angels monestary on the Gavarres. The path continues down the hill and emerges at the chapel and three or four houses of Pedrinya. 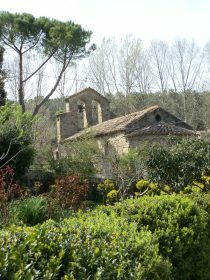 A small brook runs past the chapel with a vegetable garden (horta in Catalan) in verdent growth. We could take the path back to La Pera here, but cross the road and back into the woods, before turning left up and around the side of a low hill. At the end we emerge to the sound of tennis just outside the municipal sports ground. The road is tarmac again, but still quiet though there are two or three cars heading to the football ground for a Sunday afternoon match. The road runs down the hill with views over Pubol and La Pera. 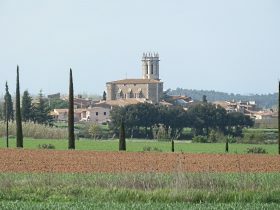 La Pera's grand church standing over the plain in constrast to the more modest church of Pubol. Pubol village itself is small with a small courtyard in the centre. From the courtyard, you turn up to the Dali-Gala castle and the church next door. From outside it is not particularly remarkable. Only the ticket office and the souvenir shop across from the church indicate that there's anything special inside. 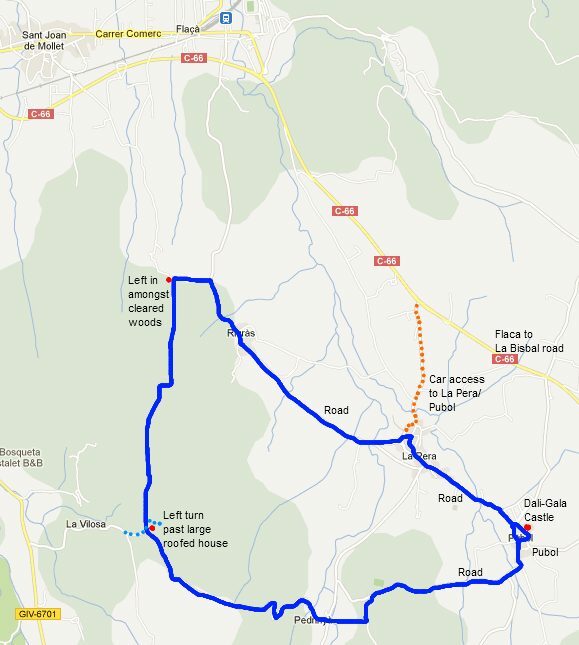 And from Pubol we walk back along the road to La Pera. There's a pavement next to the road. In La Pera families are enjoying the sun sitting outside the cafe by the church in a classic village setting of narrow streets and clustered houses.